You may not have noticed but in the main video games work because they bombard you with praise. Most games are structured so that there are numerous obstacles to overcome on the way to fulfilling an over arching goal. The majority of games (especially in the 16bit era) are broken down into levels, with clearly defined beginnings and ends. Reaching the end of a level usually results in a mini fanfare, a progression of the story or some other reward for all your efforts. Subconsciously I think, this is a reason games can be addictive. We all want constant praise, we strive for acclamation and video games do this constantly. Or at least most do. What happens then when a game removes all celebration of success? Can a game be good when goals are set out but completion of them isn’t even acknowledged? If we knew in advance that a game’s ending sequence was the same as its introduction sequence would we want to play on? 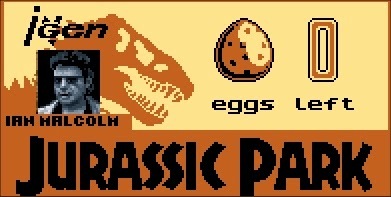 The Super Nintendo game ‘Jurassic Park’ is of course based on the 1993 blockbuster film. For an 11 year old, this film had everything; dinosaurs, car chases and even someone being killed while sitting on a toilet. This is probably the reason I wanted the game as a child, the film was fantastic so it makes sense that game would be too. ‘Jurassic Park’s setup is predictable to anyone who has seen the film on which it is based. The player adopts the role of the films main character palaeontologist Dr. Alan Grant stranded on an island overrun with dinosaurs. While the narrative of the film was ultimately pretty simple; escape from the island, the list of thing the player ends up doing in the games is slightly more diverse. In order to get a helicopter to rescue him, Dr Grant will have to restart a generator, reboot the computers, seal off the Visitor’s Centre, stop a ship from leaving with a cargo of dinosaur stowaways, destroy a raptor nest, contact the mainland for pickup, collect hidden eggs and finally get to the helipad. However accomplishing all this really does simply boil down to treasure hunting, looking for access cards to open up sealed areas, and finding computers to access the islands various systems. In the main (perhaps because they were a safe successful option) 16bit games based on films are side scrolling platform affairs. What you do while leaping between platforms will of course vary in accordance with the film that the game is based on, but for the majority a licensed games means side scrolling 2D jumping fun. However, ‘Jurassic Park’ is unlike most film adaptations from the time and is actually divided into two very different play styles neither of which involve platform jumping or a side on view. Movement around the island takes the form of a ‘Legend of Zelda’ style adventure. 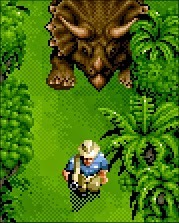 Viewed from over head, the player must solve simple puzzles, navigate mazes and avoid dinosaurs. Dotted around the over world are buildings. Once entered, play shifts to a ‘Doom’ style first person perspective shooter, albeit a very simple one. The player sees the hallways from Grant’s perspective where they have to gun down dinosaurs and mentally map the labyrinthine levels. These sections were at the time the selling point of the game, although now they have dated hideously. For me though, what should serve as short sharp, frantic dashes into building ends up as long drawn out exercises in cartography. There is no real danger or excitement to be had in buildings as the dinosaur inhabitants are quickly taken car e of due to their idiotic artificial intelligence. This was perhaps a conscious design decision to counter the player’s dexterity being hampered by a choppy four frame per second refresh rate and a lack of strafing. A dinosaur feet away from your will literally stare at you indefinably without attacking and will only activate when you’re about five steps away. You will frequently occupy the same room as several dinosaurs but their ominous presence is somewhat diminished by the fact that they just stare blankly and wait for you to line up a shot. 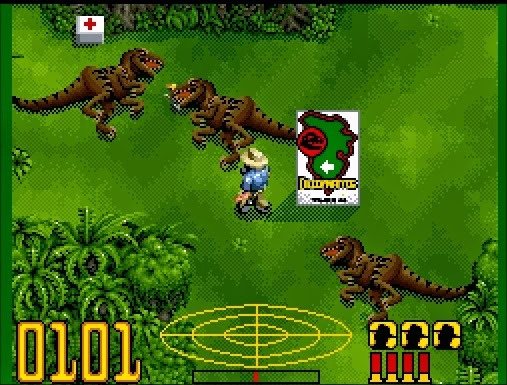 Furthermore, while the indoor dinosaurs you kill are gone for the rest of the game any and all pickups will respawn each time you re-enter the level. It’s incredibly easy therefore to stock up on the best ammunition or to pop into a building whenever you need some health, which in turn makes the outside ‘Zelda’ sections very easy. Weapons are carried across between the two different play styles, which actually makes the game feel cohesive. Both sections share the same enemies too, (even if they are viewed from different angles) but they also share the game’s biggest fault; a complete lack of clear objectives. Yes, you may presume that it’s best to avoid dinosaurs, and try to get off an island populated by them but it’s not ever made clear how you can best do this. Edge Magazine sums up this problem in their review. “To begin with a lot of time is spent aimlessly wandering around and avoiding the dinosaurs - very little help is given in which direction you should be going and exactly what you should be doing. Eventually, you'll bump into an information post where your first real mission is explained - get to a hut and turn on the park's power using the generator. Great. Now where's the hut? After much roaming and dino carnage, mentally noting every path, you eventually find it. Here the view changes into 3D perspective. But again a large portion of time is spent searching, this time for the generator.“ It’s great that a game allows you to explore a world freely, but you always need to know what you should be doing even if you opt not to do it. The significance of needing key cards to open the island sections eventually becomes apparent but where these are is never made clear. Consequently I found myself exploring every inch of confusing identically walled buildings, just to make sure I hadn’t missed something I was required to have in order to advance the game. I turned on power switches and deactivated security fences but even now had no clue if I needed to. With no map, and very little distinction between rooms, this process of complete exploration of buildings was actually incredibly confusing and dull. The game would benefit from being played in shorter doses, when this monotony and confusion would feel less apparent. However this isn’t possible as the game lacks a save function, or any form of passwords. 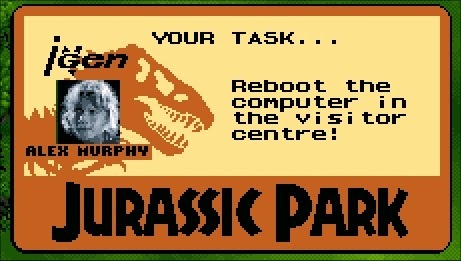 The player has to finish ‘Jurassic Park’ in one sitting and while it can be completed in around 3 hours once you know what to do, initial play through are much longer. For example without a guide or you making detailed notes, finding a key card usually means half an hour of going back to any locked door you’ve previously encountered to see if it is now able to be opened. From the second you press start to the second you leave the island a player seems to be at the mercy of blind luck. Randomly completing objectives without ever knowing why they needed to and entering every building in the hope of finding a required key card or another switch to pull. Collecting eggs seemed to be important, as for those at least there was a countdown as to how many was left. However it wasn’t until I collected the final one that I realised this was the goal of the game all along. Escape was only possible when all 18 eggs had been found, not that this was ever explained of course, I found out from using an online guide. At least while you’re doing all this egg hunting and backtracking you have something nice to look at. Graphics in ‘Zelda style sections’ are colourfully crisp and while the dinosaur enemies are drawn in a mostly cartoon style each looks recognizable. Though now terribly dated, at the time the inside sections looked even more stunning; “jaw dropping” if the staff at Total! Magazine are to be believed. “The really good thing about the [first person perspective] sections is that they are displayed in glorious 3D with rendered textures – just like a PC game. The graphics are spectacular and the 3D sections very very impressive”. It seemed to be a universal opinion amongst reviewers, with Super Play too noting how revolutionary the aesthetics of the game are. 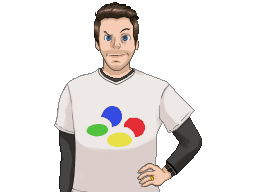 “The 3D perspectives use a technique that’s never been seen on the Super Nintendo before.” Technology advance now means that what was then cutting edge is now passé, but something that’s better stood the test of time is Jonathan Dunn’s fantastic music. With no saves, no maps and no way to even quickly check your inventory the game is hard work to enjoy. Worse still all the effort required amounts to very little at the games conclusion. Should you manage to have the patience to get through the game in one go all you will see is a repeat of an introductory sequence shown in reverse, a screen saying congratulations and a credit roll. Obviously were the process itself of playing the game amazing it would have been its own reward. Sadly though ‘Jurassic Park’ is monotonous. You're given too much freedom and the outcome of this is that you'll find yourself just wandering around in a haphazard way regardless of whether the game is in ‘Zelda’ or ‘Doom’ mode. 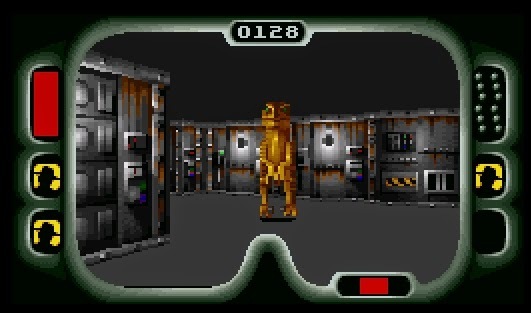 Maybe because they had aged so much better, maybe because I’m not a fan of FPSs but I preferred the exterior sections much more than the game’s indoor portions. Ideally the whole the game would have been like this, with a greater emphasis on puzzles but maybe that’s personal taste. How much you would take from the game will depend on how much hand holding you need and if you enjoy feeling confused and directionless. There’s certainly plenty that has the potential to frustrate, especially if you’re not that interested in ‘Metroidvania’ style backtracking games. It may be fun to kill cartoony looking dinosaurs with an cattle prod for a number of minutes, but what is significantly more enjoyable over a longer period is a felling of progression and success. You may eventually unearth objectives, complete them and then find the way to actually finish the game. However, any sense of satisfaction at doing this is just replaced with disappointment when you see the ending. 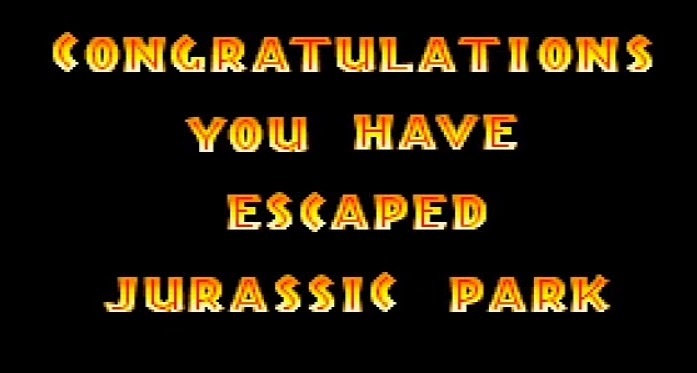 Ultimately, if games are enjoyable because they give you a constant trickle of praise followed by a big ending reward, ‘Jurassic Park’ has to be amongst the least satisfying on the Snes. This was another game I owned as a child, but was later sold when I went to University. I can’t quite remember the exact time I got it, but presumably it was bought by my parents sold on a huge film’s name being on the box. 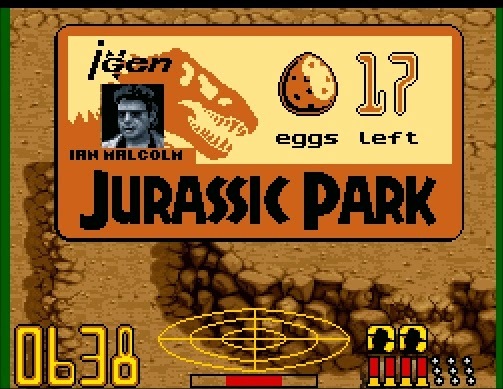 I can recall I never really got very far in it, as there’s no way an 11 year old would want to draw maps for a game at the expense of simply going around frying dinosaurs with an electricity gun. I can remember the excitement at finding a T-Rex tough, even if it promptly ate me. However with no hand holding this is not a game suitable for a child, not because of content but simply because it’s impenetrable for anyone but the most devoted. It’s not very hard to buy a copy of the game in good condition for very little money. In fact it will probably take you as long to finds as it will a required guide on the internet, as without one I’d wager you would never have the patience to make it through to the lacklustre ending.